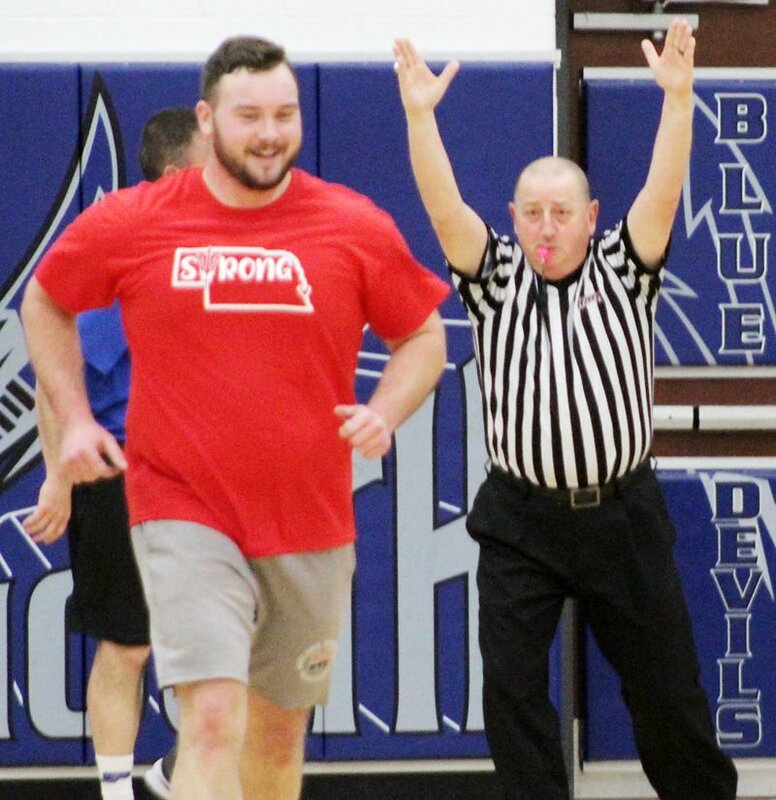 PLATTSMOUTH – Humor, hard work and big hearts proved to be a winning combination Wednesday night during a basketball game that raised thousands of dollars for flood relief. Hundreds of people came to Plattsmouth High School’s gym to watch a charity basketball game. A team of Plattsmouth coaches and teachers squared off with a squad filled with local first responders. All of the proceeds from the evening went to help flood victims in the local area. Plattsmouth head boys basketball coach Kevin Tilson said prior to the game that one of the main goals was to provide a pleasant diversion from the flooding worries. Historic floods in late March ruined many homes and property items around the Plattsmouth area. The overflowing Platte and Missouri rivers also shut down the city’s water and wastewater treatment plants. PHS teacher Andrew Wessling said Thursday night that he enjoyed seeing how people responded to the event. Residents used the opportunity to share their stories with each other in the crowd and strengthen existing friendships. They also sent a message of support to fellow citizens with their generous actions. Plattsmouth teachers came up with the idea of a basketball fund-raiser as a way to help the community both emotionally and financially. Members of the city’s police, fire and rescue departments quickly agreed to take part in the game, and plans were put in place to hold the event at PHS. The evening generated more than $10,000 for the #PlattsmouthStrong fund-raising account. Plattsmouth school social workers will oversee the account. They will disperse money to families in the Plattsmouth area who have been directly affected by flooding. Plattsmouth State Bank employees donated $8,350 in a pregame ceremony, and people gave more than $1,000 in admission fees and goodwill donations. The event also raised $306 from a 50/50 raffle and hundreds more from sales of #PlattsmouthStrong t-shirts. Organizers and participants injected humor into the game with many ideas. First responders brought a yellow police tape and stretched it across the court early in the first quarter to prevent the coaches team from moving ahead. PHS coach Megan Poppen wore bright orange socks when she stepped onto the court, and fellow coach David Davis emceed the event with his observations from various parts of the sidelines. Veteran official Larry Bleach also provided a large amount of entertainment with his actions. Bleach made exaggerated foul calls, stepped in to shoot free throws for players and delivered his trademark three-whistle exclamation for 3-pointers. He said the evening was about giving people the medicine of laughter during a difficult time for many families. The competitive nature of the game kept fans excited until the final whistle. The coaches team left the floor with a 51-48 victory. Members of the coaches team included Trey Cossel, Bob Dzuris, Curtis Larsen, Jaima Negrete, Dusty Nielsen, Dan Oatman, Jim Olsen, Steve Owens, Megan Poppen, Matt Rathman, Brian Reissig, Mikayla Rhone, Kevin Tilson, Andrew Wessling, Tim Winters and Chris Wiseman. PHS students Tucker Anderson and Andrew Rathman were co-head coaches of the coaches team. Members of the first responders squad included Steve Rathman, Neal Thomas, Jon Hardy, Leroy Lewis, Bob Sorenson, Mike Wood, Jared Cornell, Josh Alspach, Pete Hoskin, Drew Wampler, Ben Rimel, Dave Bell, Todd Carpenter and Aaron Bangham. Plattsmouth teachers are continuing to accept orders for #PlattsmouthStrong t-shirts for $20 each. Contact Megan Poppen at mpoppen@pcsd.org or Jen Hiner at jenhiner1980@gmail.com to place an order.